English: Gray's malimbe; French: Malimbe a bec bleu; German: Rotkehlweber; Spanish: Malimbe de Gray. 5.7-6.7 in (14.5-17.0 cm); female 1.0-1.2 oz (29-36 g), male 1.3-1.7 oz (38-47 g). Black with scarlet throat; female less glossy than male, black tinged with brown, and red less intense. Bill blue-gray, eye red. Juvenile sooty brown with throat and breast dull orange-brown. Eye gray-brown. Senegal east to extreme western Uganda, south to Democratic Republic of Congo and northern Angola. 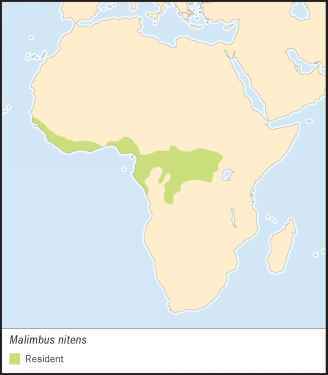 Lowland forest, oil palms, swamp forest, and mangroves; occasionally dense savanna woodland. 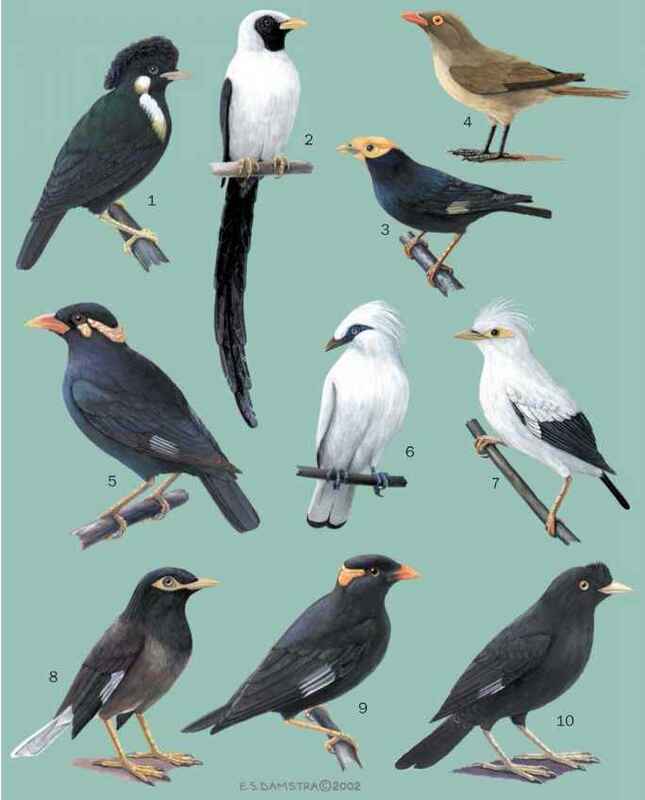 Usually solitary or in pairs, occasionally groups up to seven birds; regularly joins mixed-species flocks. Very shy except at the nest. Mainly insects, also spiders and some fruit. Forages on thin twigs, clusters of dry leaves, and vine tangles, mainly at mid-levels of forest. Solitary and monogamous, although sometimes several pairs nest close together. Male courtship, singing and posturing, occurs away from the nest. Nest is ball-shaped, woven from palm strips, rootlets, or fibers, with canopy over entrance placed low at one side; always overhanging water. In Ghana the birds appear to select nest sites close to crocodile dens. Lays one to two eggs during late summer to autumn. Incubation 14 days, fledging 16 days. Female alone incubates, and broods small chicks; both male and female feed young. Not threatened, but will not survive without undisturbed forest habitat.